mxHero, an email software provider, on Friday revealed a new email security measure that adds cloud storage security to email, offering an extra security layer for file-share links sent through emails from popular storage providers like Box, Google Drive and Amazon Web Services. 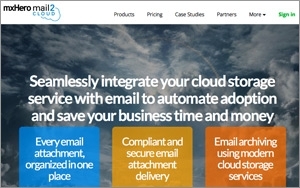 The new feature enhances mxHero’s Cloud Clips product and helps companies maintain security and regulatory compliance when sending emails that contain cloud storage files. Company administrators can now determine a minimum security setting for cloud storage file links sent through email. For example, a link could be set to expire automatically in seven days or require password authentication to access. If a company employee accidentally sends a file without the appropriate security measures, mxHero Cloud Clips will automatically reset it to the defined security standard. According to mxHero, this process reduces a company’s risk of security breaches and avoids inconveniencing employees. It also helps solve human error. mxHero states that the service works with every third-party email system. The cloud storage market is expected to grow to $65 billion in 2020 from $18.86 billion in 2015, according to a recent Research and Markets report. This equates to a whopping compound annual growth rate of 28.22%. The market growth has been a boon for businesses like Box Inc., which posted a 43% jump in Q2 revenue this year. As cloud storage solutions become more popular and standardized in business, it will be important for companies to take extra security measures to ensure these files are not easily hacked via email. mxHero's Cloud Clips could be a useful tool for email users in industries with stricter regulations for sharing documents such as the legal, health and financial industries.